Boost your GREENS intake the easy way! 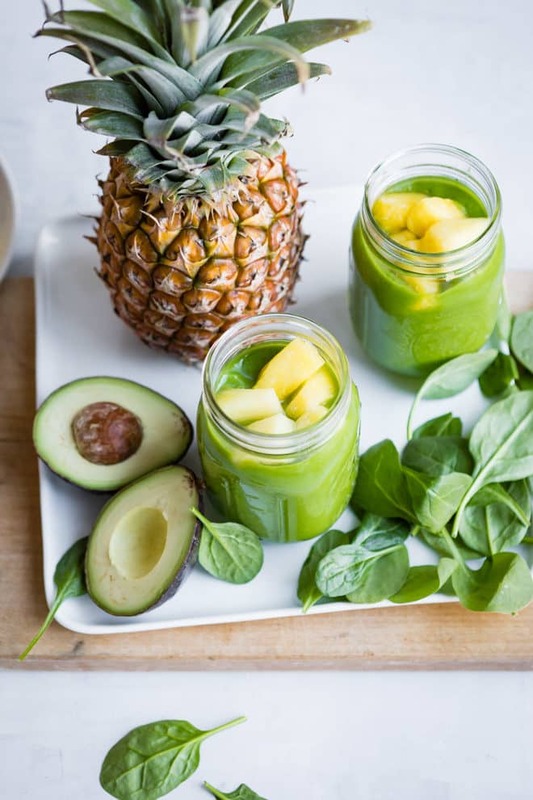 Fresh spinach, smooth avocado, and plenty of sweet pineapple make for one tasty Pineapple Paradise Spinach Smoothie. Scroll down for a video to see how easy it is to make. When you factor in the prep and cook time PLUS the fact that your kids might not want to eat what you made, the task can be daunting. Here’s one of the better ideas I have: A delicious, creamy smoothie that tastes sweet, like pineapple, but has the nutrition of spinach and avocado. Drink thy veggies. To get the smoothest, creamiest smoothie without pieces of spinach, a high-powered blender is recommended. The two major players here are Blendtec and Vitamix . Both are great! I have a Blendtec at home but I use a Vitamix in culinary school. Just be sure to add your liquids first (in this case, water). I am not a nutritionist. The complete benefits of spinach, or any ingredient, are beyond the scope of my expertise. I also cannot speak to the benefits of raw vs. cooked spinach. Spinach is high in niacin, zinc, protein, fiber, vitamins A, C, E and K, thiamin, vitamin B6, folate, calcium, iron, magnesium, phosphorus, potassium, copper, and manganese. 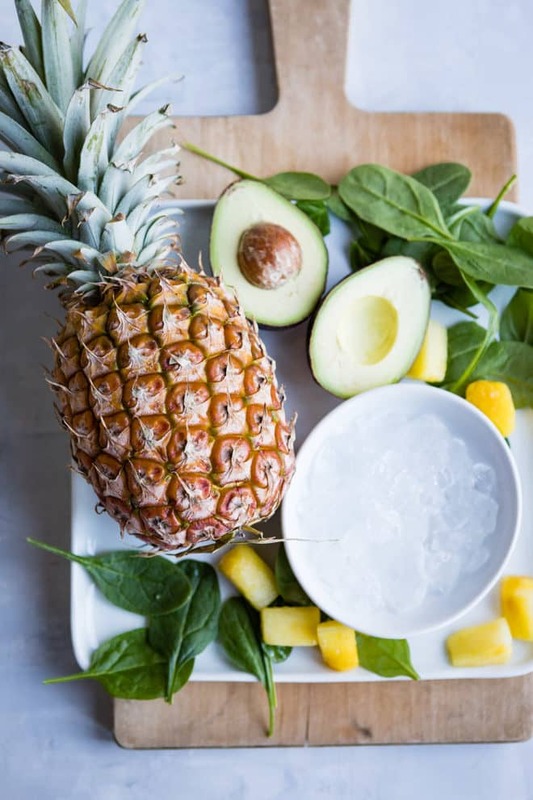 The other ingredients in this smoothie, avocado and pineapple, have their own complimentary health benefits including increased vitamin and mineral absorption and lots of healthy fat. Not a chance! This one tastes sweet like pineapple and creamy like ice cream (thanks to the avocado). You won’t even notice the spinach. Is it ok to eat spinach every day? Yes, sure! There are so many nutrients in spinach, it can be advantageous to eat it regularly. However, spinach should be part of a wide, varied diet (so eating ONLY spinach is not a good idea). 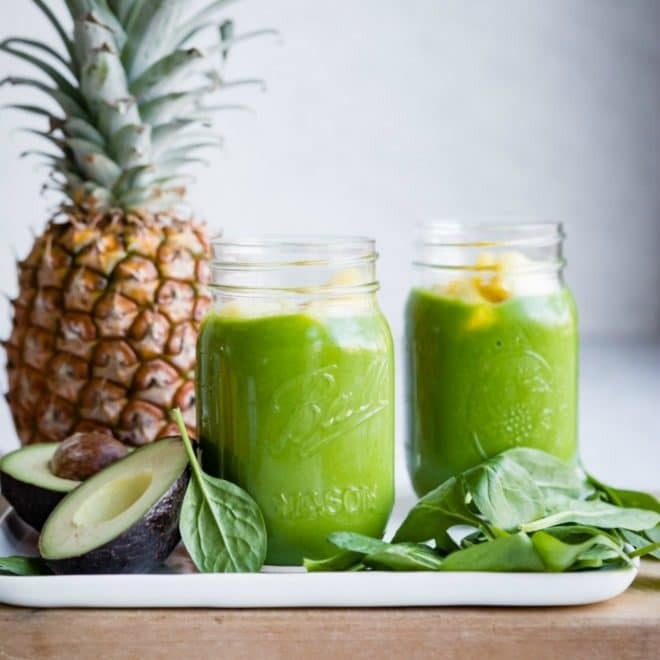 Save this Pineapple Paradise Spinach Smoothie to your “Breakfast” Pinterest board! Boost your GREENS intake the easy way! 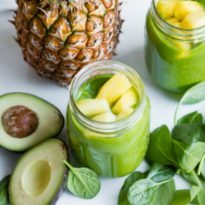 Fresh spinach, smooth avocado, and plenty of sweet pineapple make for one tasty Pineapple Paradise Spinach Smoothie. Adapted from Fresh Blends .